I did the Sun Run 10K yesterday. Had an absolutely great run. My time was 1:03 which is about 4 1/2 minutes better than the previous year. I was pushing for under one hour…but there is always next year. The Sun Run is an interesting experience. Now that I have competed in a few different races over this last year, I can see the variables and how they affect me as a runner. 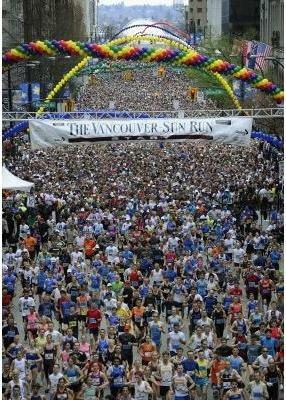 The Sun Run is one of the largest 10K’s in North America. It attracts on average 50,000 people. This year we had 48,905 runners participating. That’s a lot of people. It is a beautiful course through downtown Vancouver. We run over by Stanley Park then along the water over one bridge, past Kitsilano then back over another bridge. There are about 4-5 areas that get bottle-necked and can slow you down considerably, so you really have to run this race strategically in terms of where you can perhaps make up for the times where the sheer volume of people caused you to lose time. That said, the Sun Run is an event. It truly is. People are dressed in funny costumes…people come out to just walk it…people come out raise awareness…people come out to just be involved. It is quite something to be standing at the beginning with 50,000 other participants singing the national anthem just prior to start time. They start with the wheelchair athletes, then the elite athletes….then it goes by colour. When we register, we estimate how fast we can do the race in. I had put down 45 min- 1 hour. So I came very close to achieving that goal. It is not a race that you will ever be able run exactly the way you might want to just because of the number of people. Your position is changing constantly. You have to zigzag along as you pass people and everyone is doing this so you have to remain mindful of everyone around you and they really are at arms length. The energy is just amazing though. There is a collective thing that happens at certain points along the way. And when we come up the ramp onto the Cambie Street bridge then peak and begin the downward slope toward the finish…then see the finish line…man, it is this collective surge. And you feel it! You are connected to each and every other person out there. The elation that we all feel is palpable. Everyone’s pace picks up as we pound it out to the finish line. It isn’t about speed for the majority of people out there. It is about completion and participation. paste this into your url and you will get a partial picture of the start of the race. Quite something. My next race will be the Coho….which is 14K but that is not until September…so I will continue with my training. All in all…great fun yesterday.